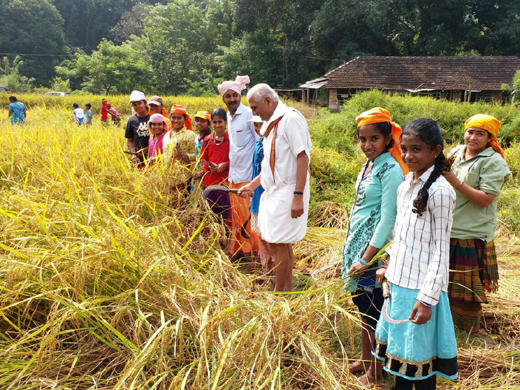 Kalladka, Oct 24, 2017: Sri Rama Vidya Kendra, run by RSS leader Kalladka Prabhakar Bhat, harvested paddy grown by children in the school premises under ’Grama Vikas’ programme. 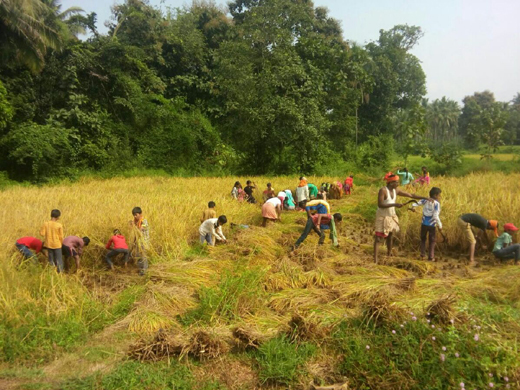 The school has over 3,500 students, those interested in agricultural activities have been taking part in cultivation of paddy and other crops at three acres of land at Kalladka. The government had recently withdrawn Kollur Temple’s school adoption programme and as a result, the school run by Bhat had lost financial support from the temple for its midday meal programme. Art and craft teacher of the school Jinnappa Elthimar, who is instrumental in introducing students to agricultural activities, said that paddy was sown in about 80 cents of land. "The school was serving midday meal to students even before the government started sanctioning funds. Cultivating paddy, vegetables and taking up other agricultural activities are part of school’s initiatives to attract children towards rural life. Children from class 4 to 9 are given opportunity to take part in such activities," Jinnappa said. The school gets an average of two quintals of paddy every year which is used for mid-day meal scheme. Though, this rice is sufficient only for few days, the main objective of cultivating paddy is to make children learn agriculture, he added. The school has two separate associations to promote agriculture. While Raitha Vidya Sangha is for high school students, children in lower classes work in fields under Krishi Vidya Sangha. Activities are not compulsory, he said. Children along with school chief patron Bhat, participated in the harvesting. Jinnappa said that in addition to students, their parents and teachers also take part in the agricultural activities in the school. The school also takes help from experts to guide children, he added.